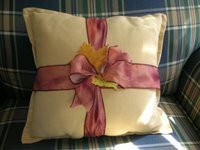 Here is a picture of how I turned it into a Fall pillow by adding ribbon and a few leaves. Here is a picture of the same pillow now all done up for Christmas! Come January I will get some snowman ribbon and place a snowflake in the middle. February hearts, etc.... You get the idea! 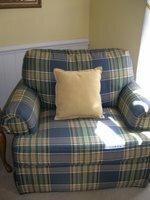 This is my final decorating transformation out of that same spool of red gingham ribbon. A total of six different changes for only $1.99!! What kind of "ribbon magic" can you perform at your house? your pillows are so cute! I would love to do that at my house, but hubby always uses those pillows. Oh well.... maybe I can think of something else! 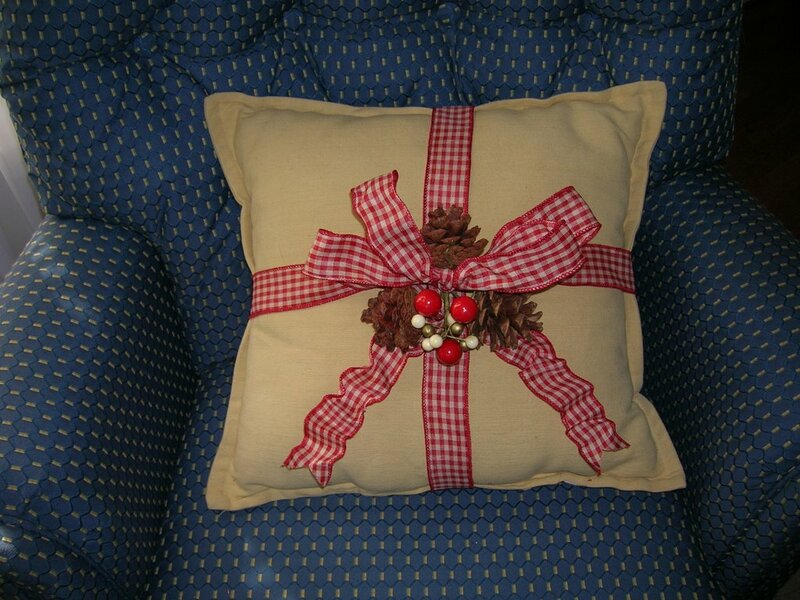 I love the Christmas pillow and your ideas for the coming months. I also have the same ribbon and as soon as I am finished I will take a picture to share with you. Susan, your pillow looks so pretty and decorated for Christmas now. I'm looking at the ribbon and wondering if it's the kind with the wire edges to stay formed a bit firmer? I like that kind and think it works well. Great job on all your sprucing up with just one roll of ribbon! Oh, to have the eye for detail that so many of you ladies have! I love looking at all the pictures you post of your home and decorating, because it gives me some ideas for my own home. I love the pillow changes! The pillow is adorable! Great creative and frugal ways to spruce up the decor! Susan, I LOVE all your pillow magic! I thought of you in the ribbon aisle at Michael's today and picked up a few spools. I updated my fall pillow too! Your pillow is so pretty. What a GREAT idea!! It's very pretty!! All of your ribbon decorating hints are great!!! Looks great! Deb, yes, it is the wired edge ribbon! It is so easy to work with and the ribbon holds it's shape!